After at least one photographer criticized Taylor Swift for posting photos she didn’t have the rights to without attribution to her Instagram page, Swift now appears to be putting up photos with image credits. On Tuesday, Jezebel pointed out that Swift had been called out for the type of contracts she has photographers sign to shoot her shows—photographer Jason Sheldon said it was the same type of exploitation Swift had been accusing Apple Music of when they announced they’d be streaming music for free for the first three months of their service without paying the musicians. In that same piece, we reported that another photographer, Josh Johnson, had criticized Swift for reposting a photo he’d taken of her show on her Instagram and other accounts without crediting him. 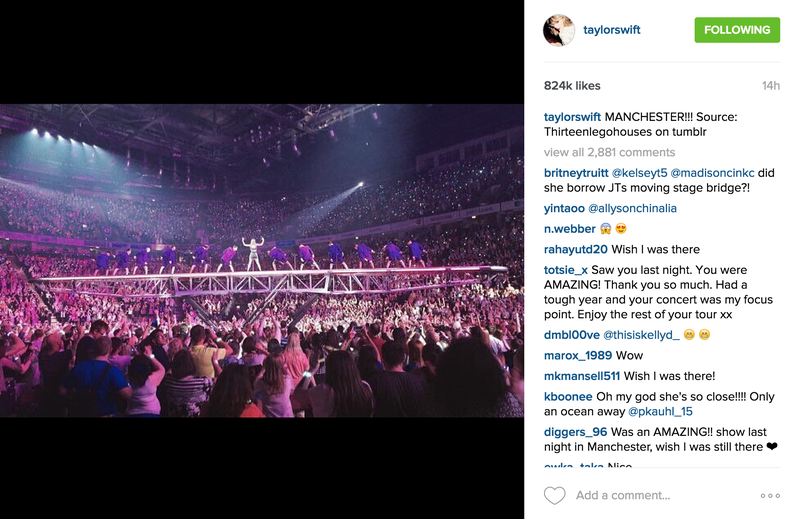 But as Johnson points out, on Wednesday, Swift performed in Manchester, England. Tumblr user Thirteenlegohouses, aka a young woman named Becky Byng, attended the show, posting this photo to her Instagram and Tumblr. “And I don’t know how it gets better than this” 😭💙 @taylorswift thank you so much!!! And also thank you to everyone commenting and liking and freaking the heck out with me!!!!! I’d just like to say that I have no idea how this actually just happened, I never in a million years thought it would. I have tried on tumblr and twitter a lot but I’d kind of given up hope. DON’T. She will notice you and when she does you will die. The comments on both her account and Byng’s are full of excited congratulations from other Swift fans. So it seems like all’s well that end’s well, in the case of Taylor Swift v. Her Rabid Fans: They get the attention they want, and she gets even more love. Win-win.